Energy drinks of various brands have flooded the market and are available over the counter and have become popular among the youth. Energy drinks are non-alcoholic beverages advertised as boosting energy. They contain caffeine, guarana, glucuronolactone, taurine, ginseng, inositol, carnitine, B-vitamins, etc as main ingredients that act as stimulants. These drinks contain high levels of caffeine, which stimulates the nervous system. Some contain high levels of sugar, and many brands also offer artificially-sweetened 'diet' versions. Energy drinks do not provide electrolytes. A variety of physiological and psychological effects have been attributed to energy drinks and their ingredients. Excess consumption of energy drinks may induce mild to moderate euphoria, agitation, anxiety, irritability, insomnia, nausea, abnormal heart rhythms and emergency room visits. Consumption of a single energy beverage will not lead to excessive caffeine intake; however, consumption of two or more beverages in a single day would. Other stimulants such as ginseng may enhance the effects of caffeine, and ingredients such as guarana themselves contain caffeine. Adverse effects associated with caffeine consumption in amounts greater than 400 mg include nervousness, increased urination, and stomach upset. Excess caffeine in energy drinks can excrete water from the body to dilute high concentrations of sugar entering the blood stream, leading to dehydration. Today, a lot of people tend to mix energy drinks with alcohol, which makes the effects even worse, as energy drinks are stimulants, alcohol is a depressant. Energy drinks can lessen the subjective effects of alcohol intoxication like dizziness and headache. However, they may be unable to counteract some of the psychomotor impairments of alcohol intoxication and can be hazardous as energy drinks can mask the influence of alcohol and a person may misinterpret the actual level of intoxication. In fact, people who drink mixers are more likely to drink alcohol in excess, and are also more likely to suffer alcohol-related consequences. The growing availability of energy drinks is a potential danger to the health of young people who are vulnerable to the effects of caffeine. The amount of caffeine in an energy drink isn't always indicated on the label, so it is difficult to gauge how much one is consuming. Another problem with energy drinks is that unlike hot coffee or tea, which is sipped slowly, it's common for typical energy drink consumers to drink large amounts quickly. Energy drinks should not be confused with sports drinks, which are consumed to help people stay hydrated during exercise. Sports drinks also provide carbohydrates in the form of sugar and electrolytes that may be lost through perspiration. 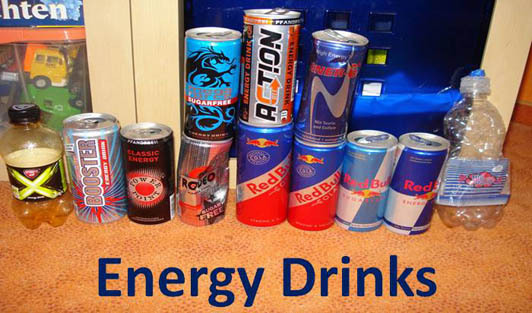 Though energy drinks are not bad if used occasionally, it is important to use them correctly. If someone consumes too many energy drinks in a small time span, there are sure to be health risks.